There’s a really great little area in Downtown San Jose that’s absolutely packed with places to eat. From tiny little sushi bars, to Greek to Mexican to classic American diners there’s so much to choose from. One place I ate in a few times was The Farmers Union. 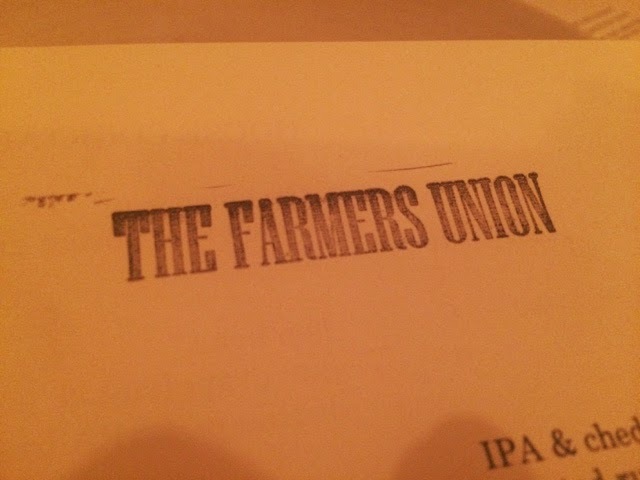 The The Farmers Union has a pretty large dining room centered around a bar in the middle with bar seating as well as separate tables and a mezzanine level. The whole place has a really cool laid back vibe with a casual feel and industrial decor and some really funky features such a custom stained glass window above the open kitchen and a cow mural on the wall. The menu is pretty varied so it’s hard to classify as a certain type of cuisine but there are some classics with a modern twist as well as some more contemporary dishes on offer. To kick things of we shared a few starters of calamari and asparagus so that we could all try a couple of different things. 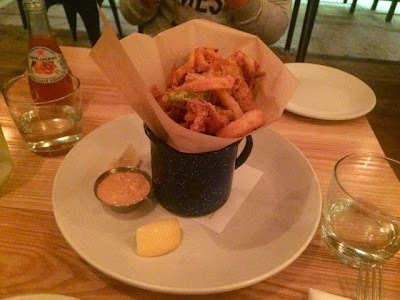 As much as I love calamari and it’s an absolute favourite, it does tend to be more or less the same everywhere you go: served with a wedge of lemon and tartare sauce (not necessarily a bad thing), but at The Farmers Union it’s done with a bit of a twist. The really crispy batter had a bit of a kick to it and deep fried peppers and fennel were mixed in among the squid. It was nice to have a variety of things to munch on. Harissa aoili made a nice change too, it’s good to mix up such a classic dish every now and then. There was still of course, the obligatory wedge of lemon. I was happily munching my way through calamari, naïvely thinking this was the best of the starter selection, when a few minutes later the asparagus arrived. I’m a big fan of asparagus but I never expected to be blown away by it. 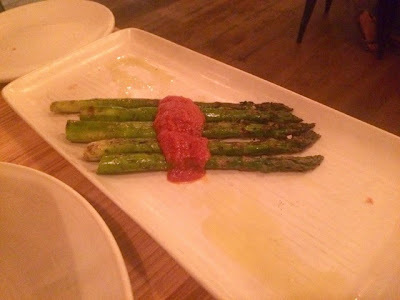 Seasoned with smoked sea salt, it was mouthwateringly delicious and complimented well by the Romesco sauce. 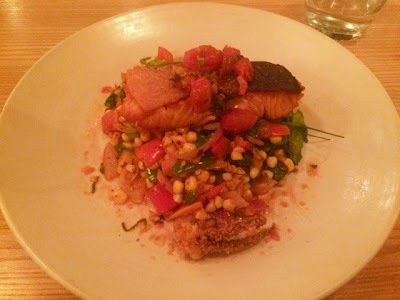 Despite there being plenty of steak, ribs and burgers on the menu (in true American style) I went for a lighter main of salmon with succotash. I perfectly nice piece of salmon was really made great by the perfectly crispy skin on top. It’s amazing how doing the skin properly can really transform a piece of fish. I wasn’t really sure quite what succotash was or if I’d had it before. It’s one of those things you’ve heard of and have a vague idea of but hadn’t quite managed to come across it yet. For my British readers it’s basically a bit of a sweetcorn and vegetable medley. It was really packed full of different flavours and one of those things that makes you feel good about yourself because you know you’re consuming loads of nutritious goodness but it’s also really tasty too. 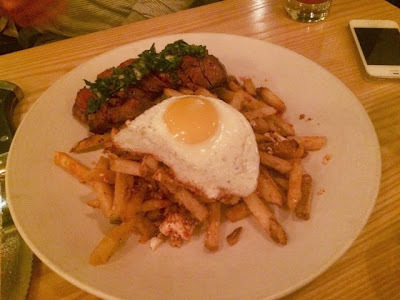 A few friends tried the steak on our visits here and by all accounts it was very good. I can personally vouch for the dirty fries, with tonnes of garlic, a bit of a spicy kick and cheese they were naughty, but oh so nice. We just about had room left for desserts and I went for the crème brulée. The real test with a crème brulée is the very first crack in the caramelised topping, you want it to break fairly easily but not be so soft that it won’t crack into shards. 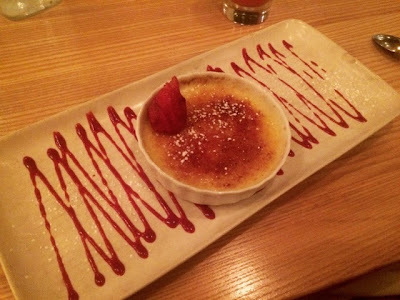 Thankfully this crème brulée didn’t disappoint. A lovely crisp topping and deliciously creamy and chocolatey underneath. You couldn’t really ask for much more from it. 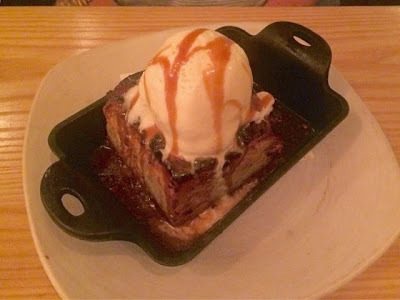 There’s a really good selection on The Farmers Union dessert menu. Another notable stand out dish was the salted caramel bread pudding, not as heavy as you’d expect and the caramel was to die for. The Farmers Union is a really great place for a great value, very decent meal in a chilled out environment. A great place for social gatherings and I would imagine a great place to get chatting to people if you were to take a seat at the bar. Having tried a few different things on the menu and one night visiting with a party of fourteen who all left happy and satisfied, I really couldn’t find much fault in any of the food here. Another USA favourite that I’d like to take home with me!